With a name like Electric Orange and an album title like Krautrock from Hell, you pretty much know what you’re getting, and indeed there’s no question that this Austrian group inhabits that ever-growing domain of music known as neo-psychedelic space rock. Don’t expect anything blindingly original here. What you get however is nearly an hour and twenty minutes of excellently crafted 21st century psychedelia with a prog rock chaser. According to the group’s Myspace page, they’re apparently influenced by virtually every band from the 60’s and 70’s. It shows too on Krautrock from Hell, though certain prog forefathers shine through brighter on the disc’s seven tracks. The Middle Eastern groove of “Chorg” reminds one instantly of Gong at their most mystical, while Dirk Jan Müller’s hyperdriven organ has more than a touch of Nektar and Amon Düül II. The album’s centerpiece, the 25-minute “Neuronomicon,” reaches epic proportions of cosmic grandeur that evoke comparisons to Yes, King Crimson and Pink Floyd. 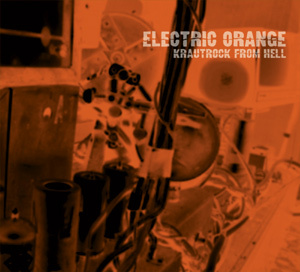 Moving from elegant, classically-inspired passages of quiescence to thundering, fuzz-drenched heaviness, “Neuronomicon” defines the terrain the Electric Orange spacecraft explores: driving organ, soaring mellotron, molten guitar, and a hammer-and-tong rhythm section flanked by occasional electronic effects flying out of the ether. Primarily instrumental (only two of the seven tracks feature vocals), Krautrock from Hell dispenses with libretto in favor of instrumental libido, achieving a flawless mix of prog rock chops and space rock grooves. In sum, a worthy addition to any 3rd millennium asteroid chaser’s CD collection. Electric Orange is back with another very long CD of spaced out psychedelic krautrock and some of it is very experimental! Bandwurm starts things off with a heavy bass line and some strange samples and cool spaced out organ parts in this psychedelic starter track. Sundog is an uptempo, Hammond driven track with a quite repetitive groove but just gets more and more intense and psychedelic. Very cool track. Chorg is nearly 11 minutes and starts more slowly but builds up with a lot of different breaks but always a very cool flow and occasionally some psychedelic samples are thrown in. Hers is where things start to get pretty strange on this CD. This track is very strange to start and then it suddenly gets semi-normal and there is actually some singing, which is not that common in this band. This is the most mainstream, if you can call it that, track the band have done. Very melodic. Kunstkoft begins with some Hammond and but is quite slow and spacey as it builds up into a beautiful track. Neuronomicon is the 25 minute monster of the CD. It starts with some acoustic guitar playing and but then the track really takes off. This one has a lot of stuff happening over the 25 minutes. The CD ends with a very far out track called Würmloch. Overall, an excellent krautrock adventure but not quite from Hell!